Last week was the FIRST time since last February, that we saw some REAL football in the College Circuit. The College Football season got underway and there were a TON of takeaways from last week. In this blog, I have FIVE big takeaways from last week and FIVE things I am looking FORWARD to this weekend. WHOEVER in the Texas athletic administration scheduled a home and home with Maryland, has the WORST luck of ALL TIME. Maryland is in SHAMBLES due to CONTROVERSIES in the offseason, but Texas was so BAD on Saturday, that the Terps got a WIN that can RALLY them for the REST of the season to get a Bowl game. For Texas, this LOSS is going to affect their Bowl game and they NEED to WIN their remaining games for the month or else they might in SHAMBLES. It has been over TEN years since App State UPSET Michigan and history almost REPEATED itself on Saturday for Penn State. The game between Penn State and App State was SUPER CLOSE and App State had the lead in the Fourth Quarter but they could NOT hold on and LOST to the Nittany Lions in OVERTIME. This WIN was UGLY for Penn State and they need to get A LOT better this weekend in ONE of their first RIVALRY games of the season. TWO: Alabama and Clemson are GOOD, but what is NEW? Alabama and Clemson ROLLED this weekend and are probably going to make the Playoff this season, so why even watch their games this season. There was a TON of HYPE about Michigan being BACK and POSSIBLY winning the Big Ten this season, I even had them WINNING the Big Ten in my preseason preview, clearly I was WRONG. The Wolverines got CURBSTOMPED by Notre Dame and they will PROBABLY finish FOURTH in the Big Ten East. 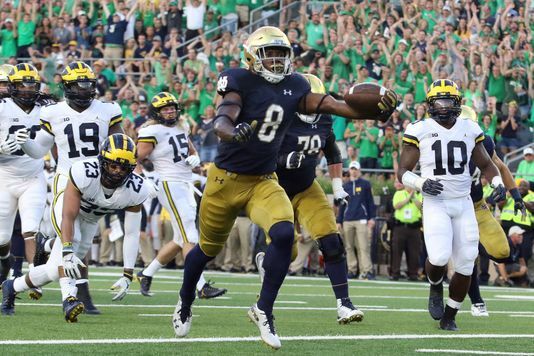 For Notre Dame, this was a BIG win and they are SET for RUNNING the table and making an ARGUMENT to be the FIRST non Power FIVE team IN the College Football Playoff. There are SOME SEC games this weekend, the marquee game is Georgia vs South Carolina and is NOT even going to be CLOSE. Georgia looked GOOD last week, but this week is their COMING OUT party and they will BASICALLY clinch the SEC East this weekend. UCLA and Oklahoma have GREAT offenses and offensive minded coaches and BAD defenses, so I expect a TON of points this weekend. I am NOT doing picks this season, but I LOVE the OVER in this game. Penn State and Pittsburgh are NOT traditional RIVALS but since the TWO have been GOOD the last couple of seasons, this match up has become one of the MARQUEE games of the weekend. The ONLY reason Penn State did NOT make the College Football Playoff in 2016 was because a LOSS to Pitt and after a BAD win against App State, the Nittany Lions need to come out FLYING this weekend. USC, Stanford AND Washington are the MARQUEE teams in the Pac 12. USC and Stanford play each other this weekend so the WINNER of this game will have an INSIDE track to WINNING the Pac 12 and POSSIBLY making the College Football Playoff. The MARQUEE game of the weekend is Texas A&M vs Clemson in College Station. This is the FIRST real game for Jimbo Fisher at Texas A&M, who has a HISTORY of BEATING up on Clemson and that is going to carry over this weekend. Earlier in the blog, I said that Clemson is GREAT and they are but Texas A&M is my MORTAL lock of the weekend.